A calibrated auction-conjoint experiment to elicit consumer valuation of sustainable farming:is agro-systems preservation relevant? Avitia, J.; Costa-Font, M.; Gil, J.M. ; Lusk, J.
Avitia, J. [et al.]. 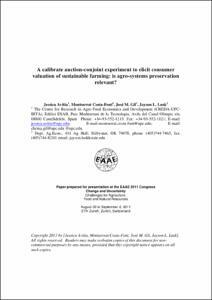 A calibrated auction-conjoint experiment to elicit consumer valuation of sustainable farming:is agro-systems preservation relevant?. A: Congress of the European Association of Agricultural Economists. "XIII Congress of the European Association of Agricultural Economists (EAAE)". Zurich: 2011, p. 1-14.